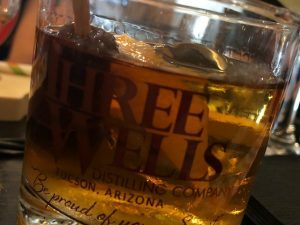 We celebrated World Whiskey Day with great enthusiasm on this weekend’s show, and the backdrop was a new tasting room in downtown Tucson that showcases, serves, and sells spirits and cocktails exclusively from Arizona-based distilleries – Series 19! Our celebrity co-host was a true Wonder Woman of Whiskey, Melinda Dickinson of Hensley Beverage Company, who shared what she’s been grooving on these days. We also sat down with Caity Evans of Local First Arizona and Tucson Originals who revealed the latest information on the upcoming Whiskey and Smoke event. 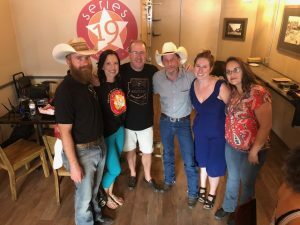 Keeping the whiskey theme going, we welcomed Matt Montgomery and Chris Dudding of Three Wells Distilling Company, the boys behind Series 19, for some sipping and chatting about their new downtown digs. The Series 19 Old Fashioned! And when Series 19 bar manager Tyler Dunn showed up with cocktails, well, it took the show to new heights. Let your spirits soar at Series 19!